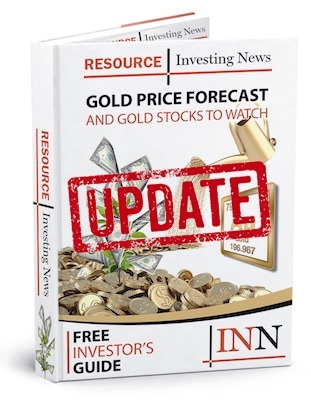 Industry heavyweights David Morgan, Rob McEwen and John Kaiser share their thoughts on how high the gold price could eventually go. At this year’s PDAC convention in Toronto, experts David Morgan, Rob McEwen and John Kaiser shared their thoughts on gold’s long-term price potential. They each gave their input on how high the yellow metal could go in the coming years, with some gold experts giving estimates of up to $10,000 per ounce — much higher than the current price of about $1,325. Morgan, who publishes the Morgan Report and is best known for his commentary on silver, said gold could rise as high as $10,000 in the future, explaining that the outlook has a historical basis. “I think, looking at the gold situation and the increase in the money supply from what we saw in 2000, which had basically a four-fold increase in the money supply, if you took all the gold and divided it into the amount of dollars in 2000, we’d come out with $2,500,” Morgan said. “If we’ve increased the money supply from 2000 to 2018, you take that number and multiply it by four, which would give you $10,000. I don’t think it’s really out of the question,” he added. McEwen, who’s chairman and chief owner at McEwen Mining (TSX:MUX,NYSE:MUX), is well known for his call for $5,000 gold. Like Morgan, he cited historical statistics, but jumped further back in time. “When gold was broken free from its link with the US dollar back in , it was just [around] $40 an ounce, and by the end of the decade, the beginning of , it was over $800,” McEwen explained. As for Kaiser, in January he suggested that gold could reach as $1,600 to $2,000 this year — that’s much more modest than $5,000 or $10,000, but also much higher than most 2018 predictions. Do you think the gold price could rise as high as these gold experts predict? Let us know your thoughts in the comments.